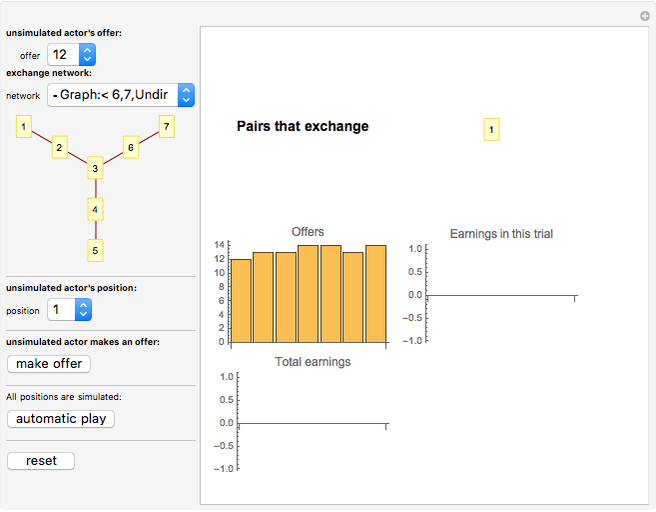 This is a simulation of behavior and the development of power differences in negatively connected exchange networks. Pairs of connected nodes bargain over the distribution of 24 points. Each actor can be involved in only one exchange per round. The offers of one selected unsimulated actor can be set by the user. Otherwise the offers of all actors are simulated. If simulated actors are excluded from one round they increase their offers to others in the next, and if they are included they reduce the value of their offers to others. K. S. Cook, R. M. Emerson, M. R. Gillmore, and T. Yamagishi, "The Distribution of Power in Exchange Networks: Theory and Experimental Results," American Journal of Sociology, 89, 1983 pp. 275–305.